Some miscellaneous photos of Hamburg. 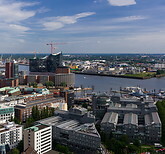 The harbour area is currently being redeveloped in the framework of the Hafencity project, which foresees the creation of housing for about 10000 inhabitants and 15000 workers. The Elbphilharmonie (Elbe Philharmonic Hall, an opera house) will be completed by 2015.